This permanently reliable ZinCo system build-up consists of the following functional layers: protection, drainage, system filter, substrate and plants. Technology centre in Munich (Germany), ZinCo system build-up ”SolarVert“. Wellcome Trust Sanger Institute in Hinxton, ZinCo system build-up "Pitched Green Roof"
Moorgate Crofts in Rotherham, ZinCo system build-up "Rockery Type Plants"
Technoseum in Mannheim (Germany), ZinCo system build-up "Urban Farming"
"Jubilee Park" Canary Wharf in London, ZinCo system build-up "Green Roof over Underground Garage"
Hardly any other roof shape allows for such a variety of uses as the flat roof. Depending on the design, a green roof offers a new habitat for fauna and flora and utilizable open and recreational space for people. The more densely populated an urban area the more invaluable is such space. 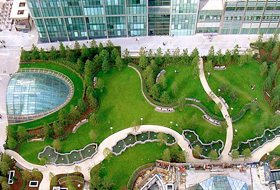 As a pioneer for more than 40 years in matters relating to green roofs, the name ZinCo stands for permanently reliable green roof systems – suitable for any roof and any design. Whether it’s a typical flat roof with a 2 % slope, a 0° roof, a pitched roof (A-framed, butterfly, shed or saw-tooth roof) or a vaulted roof (barrel roof), a green roof can be installed on roofs with a pitch of up to approx. 35°. ZinCo will supply the system build-up that is most suited to the roof shape, the roof structure and the green roof requirements. There are basically two types of green roof: intensive and extensive. 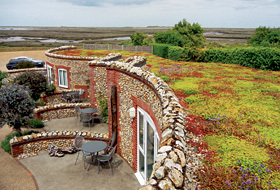 An extensive green roof may cover a large area but it can be installed and maintained at a relatively low cost. The layer depth is approx. 5–15 cm and the weight is low at between 60–150 kg/m², allowing for the easy greening of an existing roof area at a later point in time. A further advantage of an extensive green roof is the very manageable upkeep thanks to the fact that natural precipitation is sufficient for the plant communities used which include renewable succulents (sedums), mosses, grasses and herbage. As is the case with all flat roofs, they only have to be accessed once or twice a year in order to inspect roof drains and ventilation equipment and, where necessary, to remove any wild growth. In contrast to this, the entire range of landscape architectural design is possible for intensive green roofs – as is the case on the ground. Lawns, perennials, shrubs and trees grow in layer depths of between 15 and 100 cm, very often in combination with pathways, terraces, patios, play areas and water features. 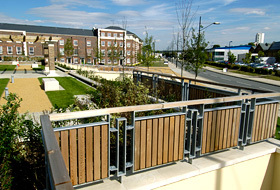 Even driveways such as that over an underground car park are possible with the appropriate structural support. Depending on the design, a weight of between 150–1300 kg/m² should be calculated for intensive green roofs and irrigation and maintenance must also be taken into consideration. 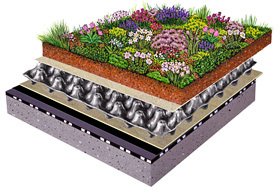 A green roof system basically consists of a number of layers, each with a different function. The base layer is always a professionally waterproofed roof. This means that the waterproof layer must be root-resistant or this must be ensured using a separate root barrier. The first layer of the build-up is a high-grade protection sheet which protects the waterproof membrane from mechanical damage. This is followed by drainage elements that retain rainwater in their water retention cells and drain surplus water through the underlying channel system to the roof drains. Depending on requirements and the type of green roof required, the drainage elements will vary in terms of height, weight and material. Where the drainage elements are installed across the whole area to be greened, this allows for drainage of the entire area, even the area beneath pathways and terrace areas. This can also serve as a lost formwork for anchoring stone walls or play equipment, for example, if necessary. The rest of the build-up consists of a filter mat installed over the drainage layer, which retains fine particles from the overlying substrate layer. This substrate layer is composed of mineral clay tile chippings and organic materials specifically adapted to suit the planned vegetation. The plants provide the final layer. Sedum cuttings, seed mixtures or pre-cultivated vegetation mats are available for extensive green roofs in addition to plug plants. 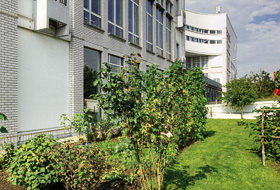 Perennials, shrubs or trees can be used for intensive green roofs. 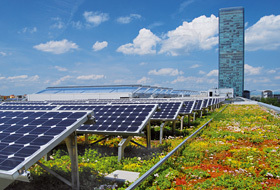 In addition to its use for conventional extensive and intensive green roofs there is yet another use for the flat roof: using a combination of green roof and solar energy. Synergy effects are already achieved here with the equipment through the use of base plates that are compatible with green-roofs and that secure the solar mountings in line with the load principle and without the need to penetrate the roof waterproof membrane. 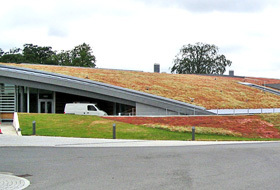 During operation, the extensive green roof provides for a comparatively low ambient temperature and therefore for increased performance of approx. 4% of the photovoltaic module. Green roofs balance the temperature differences on a flat roof and in this way help to increase the longevity of the roof waterproof membrane. 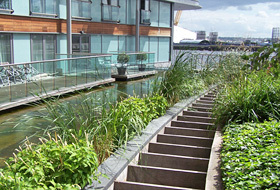 They retain rainwater (between 40 % and 90 % depending on the type of green roof) and therefore reduce the burden on the drains. The system build-up enhances the structural sound proofing and also functions as additional insulation, i.e. requires less heating in the winter and generates a cooling effect in the summer. The plants absorb fine particles and bring greenery to urban areas again. 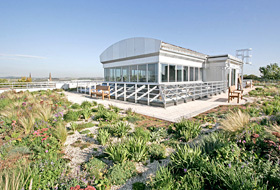 A green roof is both a practical space and an area for recreation. It is also an architectural highlight, as can be seen from the many examples from around the world. However, this is all only sustainable if green roof success is guaranteed in the long term by building-specific planning, reliable technology and the professional execution of each project. That’s what ZinCo stands for.